Inclusive Tourism: What is a "Deaf-Friendly City?" DEAF411, Inc. is researching what makes a city "Deaf-Friendly". We are collecting information about your city and would like to learn more about the city you live in, and develop information on what is needed before the city can be considered "Deaf-Friendly". Just because you use a wheelchair or a scooter or are a slow walker doesn’t mean you don’t want to travel. It does mean, though, that barriers can make it difficult and limit your choices of destinations. Veteran travel writer Candy Harrington of Ripon, Calif., (just north of Modesto on Highway 99) recognized that fact about a decade ago and decided to do something about it. She founded Emerging Horizons: Accessible Travel News, a quarterly, full-color magazine that focuses on destinations and experiences made easy for those with mobility issues. Continue reading Trang web cá cược trực tuyếnTips on Travel. National surveys show U.S. high school students with disabilities, while increasing in the numbers enrolled in foreign language courses, still lag behind their non-disabled peers in the percentages who study foreign languages. U.S. students with and without disabilities are close to equal in the percentages completing foreign language courses at the higher education level. However, the data does not explain what languages are being studied, how successful the learning experience is, and what are the barriers and benefits for people with disabilities at all ages. Are you a person with a disability from the United States who is interested in taking a survey about foreign language learning and disability? The National Clearinghouse on Disability and Exchange (http://www.miusa.org/ncde) seeks your and other individuals with disabilities input and experiences. Take a 10-minute Foreign Language survey online at: http://www.surveygizmo.com/s/47971/foreignlanguages. Deadline to submit the survey: October 31, 2008. Continue reading Foreign Language Survey Asks People with Disabilities to Respond. Handicap et tourisme is looking for input to improve information available to travelers with disabilities. Continue reading Handicap et tourisme : des informations pour bien voyager (French). ongoing problems with inclusion of Malaysians with disabilities sparked by a recent Star Metro article on unfulfilled promises related to public transit - and thus inclusive tourism. Continue reading Malaysia: Disabled in a Dilemma Over Inconvenient Travel Environment. Continue reading Trang web cá cược trực tuyếnMcFarlane Safaris: Multi-Sensory South African Safari. O Botafogo é o primeiro time de futebol brasileiro a aderir a campanha de acessibilidade promovida pela Secretaria Especial dos Direitos Humanos da Presidência da República (SEDH/PR) e o Conselho Nacional dos Direitos da Pessoa com Deficiência (Conade). O compromisso será assinado amanh? (27), em cerim?nia, às 18h30, no Othon Hotel, Rio de Janeiro. Os ex-jogadores Roberto Dinamite e Jairzinho (Copa de 70) também v?o declarar ades?o à campanha. No próximo sábado (30), no estádio Engenh?o, o time do Botafogo fará a sua primeira a? ?o em prol da campanha: entrará em campo para enfrentar o Náutico na companhia de 22 crian?as com deficiência. Cada jogador estará acompanhado de duas crian?as. O time exibirá em campo a faixa "Acessibilidade: Siga essa idéia!". Continue reading "Acessibilidade: Siga essa idéia!" (Portuguese). I skip the queues by inviting myself through all the 'elite access' lines for rich first class travellers, and no one seems to mind. We get to the bit where they screen your hand luggage. Usually, I wave at someone to indicate a stick, they put the stick through the coneyer belt first and give it back to me. On this occasion there is too much distance between me and the human being. It's noisy and crowded and I can't get her attention. So - possibly foolishly - I put the stick on the conveyor anyway and proceed: I can walk for a short while with no stick. I get stopped by a VERY aggressive security type person who orders me to take my shoes off. I explain that I am willing to take my shoes off - always important to say that first! - but I cannot do that unless I am sitting down, and is it possible for me to sit down, please? She looks confused, I guess because I don't have my stick and am not at that precise moment looking obviously disabled. So I explain again. Hilary Lister, who is paralysed from the neck down, and her support team have been beset by problems since setting sail from Dover on 16 June. Bad weather, technical trouble and injuries to crew members meant they had only managed to reach Cornwall on a trip scheduled to take four months. Mrs Lister, 36, said: "The fates have conspired against us but I am now ever more determined to go again next year." Continue reading Hilary Lister and Breaking Barriers at Sea. This report is a nice, though brief, testament to the virtues and benefits of the Special Olympics. Though it sometimes reads like a mission statement, this ends up being less troubling than you would think since the mission is admirable and, as evidence shows, effective. More than 75% of Special Olympics athletes participate for longer than 5 years, and athletes, family, and coaches report impressive social, health, skills, and personal improvement. The Special Olympics clearly affect many people in many ways, but lest we forget they are at heart a sports competition the report offers the fact that, "During the 2003 Special Olympics World Summer Games in Dublin, Ireland, 38 individual athletes' performances would have bettered performances by athletes in the 2004 International Summer Olympics in Athens." It's not hard for me to imagine how the Special Olympics are doing great things for people with Intellectual Disabilities (ID) and "to impact the perspectives of society at large toward this population." Now, after reading the report, I don't have to imagine. Continue reading IssueLab on the Paralympics. Multi-sensory travel is responsible and uniquely satisfying. I often advise clients to run through their travel products and destination development campaigns emphasizing various sensory modalities to see what enhancements or unique new products they can discover. When is the last time you had a sensory experience? So many of us go through life taking things for granted that we miss the wonders that surround us. We touch, smell, hear and see, but are we truly aware? The idea that children respond to their environment inspired the creation of a special garden at New Bedford's Buttonwood Park. It is not limited to children's use, but it's proximity to a new handicapped-accessible playground certainly encourages youngsters and those who have limited mobility to use it. Continue reading Sensory Travel -- Simpler Sensuality Sells. UNWTO plays a central and decisive role in promoting the development of responsible, sustainable and universally accessible tourism, paying particular attention to the interests of developing countries. Universal Design is also called Inclusive Design, Design-for-All and Lifespan Design. It is not a design style but an orientation to any design process that starts with a responsibility to the experience of the user. It has a parallel in the green design movement that also offers a framework for design problem solving based on the core value of environmental responsibility. Universal Design and green design are comfortably two sides of the same coin but at different evolutionary stages. Green design focuses on environmental sustainability, Universal Design on social sustainability. Continue reading Green Globe International and the United Nations World Tourism Organization. Positive development continue from the ASTA India sponsored workshop series on Inclusive Tourism. While Tourism Secretary Banerjee brings government to bear, and the Adventure Tour Operators' Association of India teams up with international experts on Inclusive Tourism at the Adventure Travel Summit and Fair in Brazil, numerous Disabled People's Organizations, tour operators, travel agencies, and Ashoka Fellows fill in with entrepreneurial vigor to open everything from convention centers, to luxury, family, and extreme travel to the disability community. Progress will not be miraculous or overnight but, if this wave of interest institutionalizes, it can be substantial. Continue reading Hopeful Signs - India and Ripple Effects. Nelida Barbeito is an Argentine expert in travel and inclusion. She is fluent in Spanish, Portuguese, and English having done university-level work in Canada and speaking or writing frequently in Brazil. Recently she presented a workshop on inclusive tourism in Buenos Aires and has done this review of the Tango bar El Barracas. Continue reading Texts and Tours: Developing the Potential of Literary Tourism. Satish Nair is justifiably proud of the new houseboat design of his company Saroma Holidays sailing the backwaters of Kerala, India. Watch for this market to open up on a global scale with help from many regulars at the Rolling Rains Report. British Airways’ application for the new Apple App Store has seen massive uptake that exceeds expectations. It’s being accessed by up to 3,000 people a day worldwide. In the first month, UK users alone exceeded 15,000. These statistics underline the importance of accessible travel information on the move and the readiness of consumers to utilise the functionality of new technologies. The application allows users to access real-time departure and arrival information for updates if catching a flight or picking someone up. It also contains full BA timetable information and enables access through to ba.com. Chris Carmichael of BA’s innovations team said: “Customer reviews on the Apple App Store site have been great and they have given us lots of ideas for the future. turismo, as inscri? ?es já est?o abertas. Continue reading Trang web cá cược trực tuyếnInclus?o: I Congresso de Turismo Muito Especial de Pernambuco (Portuguese). Candy Harrington's work is featured at the Daily Herald today in Ideas for planning an accessible vacation by Jane Oppermann. Ricardo Shimosakai is organizing the following in Brazil. With a few minor injuries added to my body during transport in India ( laceration to my toe and a pressure sore ), damage to the wheelchair, and a few good frights all around I am a strong endorser of the movement to educate the industry on basic safety and evacuation protocols for customers with disabilities. A área da Deficiência anda em festa, pois há muito que comemorar, nos últimos tempos. A audiodescri? ?o (AD) é um dos fatos mais recentes: a Portaria N.o 466 (30/07/2008) concede o prazo de noventa dias para que as exploradoras de servi?o de radiodifus?o de sons e imagens e de servi?o de retransmiss?o de televis?o (RTV) acrescentem, na programa? ?o por elas exibidas, o recurso da audiodescri? ?o, juntamente com a legenda oculta (closed caption) e a janela em Libras (língua brasileira de sinais). One of the enjoyable parts of returning home after an extended trip like the past three weeks in India s really getting to know all the extraordinary people I was able to interact with only briefly. Here is a link to the work of one such person, Akhil Srivastava and the group Antardrishti. Smile Tours is run by Hoang Thi Minh Thi in Ho Chi Minh City, Vietnam. She is expanding her tour products to include itineraries for deaf and hard of hearing travelers. She has tour guides with ASL and ISL abilities. The field of deaf tourism keeps growing! Continue reading Deaf Tourism: Progress in Vietnam. Listen to Prasad Phanasgaonkar at the Mumbai Workkshop on Inclusive Tourism on August 30, 2008. Touchdown in the USA. A swift passage through Customs. On my own - and loving it. With all my commentary about the driving style in India you would expect that reaching US soil I would be the model of good road behavior. I made myself laugh as I realized that as soon as I was free to push my own wheelchair, without the attendant crowds of "helpers" who have swarmed me over the past three weeks, I sped through the crowd at JFK darting, dodging, and feinting like a New Delhi taxi driver. I must have looked like the teenagers from the 'hoods here in California who use the freeway traffic around them (all traveling at 70 + MPH) as "stationary" pylons while they play race car driver. A couple generations ago my peers came back from India transformed by encounters with gurus and rhapsodizing on higher states of consciousness. I only seem to have turned into a second-rate livery jockey! Continue reading Driving Like India in the USA. Today I meet with the president of he Indian adventure tourism association who has just returned to Delhi. One of the topics on the agenda is what is being done in other countries. Dada Morerira's Aventura Especial will be one example I will discuss. India will ned to emulate Brazil as it took national action to incorporate modules on working with people with disabilities in adventure tourism professional certification curriculum. A roll in the park. The "Asia-Pacific Development Center on Disability" (APCD) Project is a technical cooperation project between the Government of Japan and the Government of Thailand, which is started in Bangkok on 1 August 2002. The Overall goal of the project is to promote the empowerment of people with disabilities and a barrier-free society in developing countries in the Asia and Pacific Region.
? APCD will facilitate a regional network and collaboration among disability-related government and non government organizations (NGOs) by establishing focal points and associate organizations for strong collaboration and relationships in each country in the Region. Continue reading The Asia-Pacific Development Center on Disability (APCD). Last evening I spent almost three enjoyable hours with Javed Abidi learning firsthand the history of Inclusive Tourism in India. Free2Wheel Delhi - A New Look! Today I am the guest of Shivani Gupta of AccessAbility in New Delhi. Last night she, Vikas Sharma, and I stayed up to the wee hours scheduling my next few days and discussing projects. Today we do some site reviews for a court-ordered study, meet with the Tourism Ministry, and then disability rights activist Mr. Javed Abidi. Captain John Abraham Regional Manager of WHL - Kerala reminded me as we debriefed last night that the circuit that I just completed in 4 nights is generally a 12 to 15 day itinerary. No wonder I feel like I ran a marathon. I did! The backwaters of Kerala are endlessly fascinating. This region where the agricultural land is below sea level as in the Netherlands and where gondola-like canoes are the transportation method of choice. Then there are their big cousins! I just spent the night on the water in a kettuvalum. "Kettu" means "tied" in Malayalam. The hulls are made of boards fitted, tied, and sealed into a seaworthy vessel. Typically domed with a palm-frond living compartment these lumbering boats look like cartoon caterpillars crawling slowly up and down the main channels of the canals. But after 6 PM you won't find them on the main waterways. The next 12 hours are given over to the fishermen who work he deeper waters while kettuvalums hug the shore. You are just as likely to find yourself anchored in front of a rice paddy or a small village once night time comes. I learned this morning that the traditional question the children as visitors on he boats is "May I have one pen please?" Rima here had her choice between a white and a blue one. She chose the blue one. The Disability Community as Emerging Consumer Market. NFS Communications and Publishing, Inc. is one of several agencies contributing to positive developments in marketing to people with disabilities in the US. Continue reading The Disability Community as Emerging Consumer Market..
More power to you Erik. You're right - not me on those stairs! I’m taking bets that my abs look more like those washboard midsections of tv gym equipment hucksters than they did when we started climbing to the hill stations of Kerala four hours ago. There is a rhythm to driving in India. The driving rhythm has a danceable beat. At least that’s my working hypothesis since I have isolated no other pattern of rule-based behavior in what I have observed by sitting in the front passenger seat. Continue reading Lane Jumping in India: Highway Etiquette as Workout for Your Abs. It is not exactly fair to say I ate alone. Two fire dancers sent rapid-fire flares from their mouths into the sky on the terrace just beyond the restaurant. The excited response of children was visible, if not quite audible, over the pounding beat of hip hop, traditional Kerala, or techno beats depending upon their act. Unfortunately, I had come without my camera and it remained back in my room, the only fully adapted one in the Club Mahindra Lakeview Resort, and the room was up a flight of temporarily-ramped stairs connecting the second floor to the restaurant on a mezzanine level. Continue reading Moon Over Munnar. At this stage of my India tour my consistent travel companion literally comes along in my suitcase! Arwen Bird rents Kallak'ala Retreat - a private home in Netarts Bay, Oregon adapted to accommodate her needs as a wheelchair user. Head to the Pacific Ocean while you are there! The four-city workshop tour on disability for the travel industry was a success. Endless detail and partnerships went into the design and logistics of this four-city whirlwind tour to raise awareness. All indications are that the message was enthusiastically received. One example is that, as i write from my excellent room provided by our host the Park Hotel in Chennai (Madras) I will soon visit the Taj Coromandel down the road to do an access audit. The remainder of the day will be as guests of the Tour Guides association. Lodging for my last night here in Chennai tonight has been arranged by a generous workshop attendee, Geetha Menon of Parveen Holidays. Below is a reprint of an interview recently done by The Family Center on Technology and Disability. Continue reading Interview on Family Travel. FEJIDIF ( Federación Provincial de Asociaciones de Discapacitados Físicos de Jaén ) ha inaugurado el Campo Nacional de Trabajo “Vía Verde del Aceite III” con la participación de un total de 10 jóvenes europeos. Hasta el próximo 28 de julio estos jóvenes de entre 18 y 25 a?os provenientes de Austria, Suecia, Bulgaria, Alemania, Murcia, Albacete, Vizcaya, Guipúzcoa, Murcia, Córdoba y Jaén compartirán trabajo, ocio y cultura en distintos rincones de la provincia de Jaén. Continue reading Jaén: Campo de Jovenes Segue Dise?o Universal (Spanish). Today's goal: Help spread Sailability while I'm here in India. 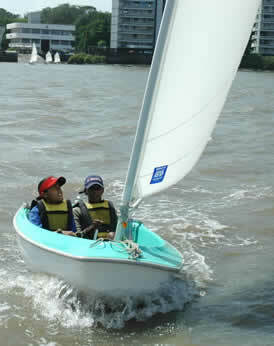 Continue reading Sailability in India. The European Air Act: The Video Version! Continue reading The European Air Act: The Video Version!. Did you know that "60% of ALL HOUSES built today in the United States will have at least one resident with a “long-lasting, severe mobility impairment” at some point in the lifetime of the house?" None of us did until publication of the article cited below. CGH Earth Hotels have been one of the generous sponsors of our workshop your through India. On checking into their hotel in Cochin we discovered that there was no grab bar next to the toilet. By the time I returned from dinner an hour or so later on had been installed. Then I noticed that my grip has deteriorated so much that I can no longer use spherical door openers. Returning from a meeting I discovered they had solved that issue as well. Sometimes the eagerness to please that I encounter in India has the unitended effect of leaving me feel mobbed. Other times it leaves me with the frightened observation that those manhandling my wheelchair (with me in it) have no training whatsoever in working with wheelchairs or protecting themselves from injury when lifting. The common element is that these "helpers" do not listen. The staff at CGH Earth's Casino hotel listen. That makes all the difference in the world. Funding for an Inclusive Tourism Project? An International Institute for Social Entrepreneurs (IISE) in Trivandrum, created by the Founders of the Braille Without Borders Sabriye Tenberken, who herself is blind and Paul Kronenberg, is all set to train about 40 young visually impaired persons from different parts of the world with skills to set up their own social or environmental projects in their countries. One measure of the penetration of Universal Design thinking into the mainstream is the rhetoric of articles on the topic. This piece by Melissa Birdsong enhances the appeal of UD with good writing. Continue reading A Home Designed for Life. "India's attitude has been: No Census, no statistics, no problem," says Javed Abidi, a wheelchair-user and a major voice for people with disability. A study stint in the US showed him how much more fulfilling life can be for people like him. He came back and started raising uncomfortable questions: "How many of us are there? Why are we kept out of the Census?" After a long battle, the Government finally yielded and Census 2001 put the figure at 2.13 per cent of India's population. But Abidi, who heads the National Centre for Promotion of Employment of Disabled People, finds the figures debatable. A World Bank report, People with Disabilities in India, claimed last year that for every 100 there are about eight disabled people in India. "If you don't see them that's because the system doesn't allow them to be visible," he says. The nation might be on a construction boom but easy access to buildings continues to be overlooked. "Builders install ramps, but in absence of guidelines, those are often all wrong," she says. "We don't have any official guidelines on proper gradient, flooring, lighting, design, symbols and signage that make a place accessible." It was this exasperation that led her to set up AccessAbility, a firm that specialises in barrier-free design and employment solutions for the disabled. Continue reading India and Disability.